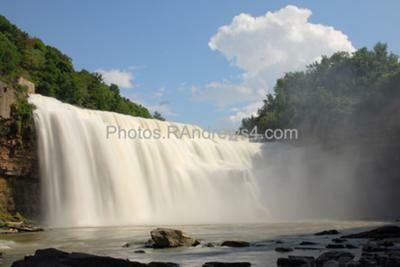 The Iroquois name for the Rochester area is Cas-con-sha-gon, meaning river with falls upon it.” The Genesee River has three waterfalls in Rochester as the river plunges over the Niagara escarpment. (There are four waterfalls if you count the Court Street dam.) Several more waterfalls were formed when streams entered the river gorge. There are smaller waterfalls in the Irondeqoit valley (which was the pre-ice age route of the Genesee river). High Falls is closest to the center of the city. This waterfall provided the power for the mills when Rochester was Flour City instead of Flower City. The base of this waterfall is owned by Rochester Gas & Electric and is not open to the public. There are viewing areas on both sides of the river and on the pedestrian bridge that spans the gorge. 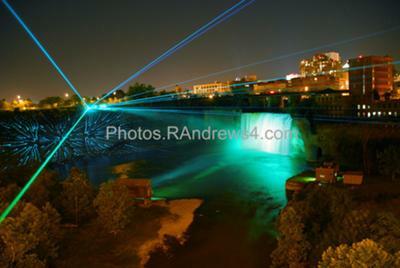 There have been laser light shows at this site on summer weekends, but funding is uncertain for the future. If you follow the River Trail (http://www.rochestertrails.info/RochesterTrails/genesee-river-trail) to the north on the east side of the river past the High Falls Brewery, the trail will lead down to the Middle Falls. The trail proceeds across the catwalk of the dam that is immediately above the Middle Falls. Once across the dam, you are in Lower Falls Park. There is a great view of the falls from near the brink. If the river is running high and the weather is clear, there are beautiful rainbows visible from this park. To get to the base of the lower falls, continue on the river trail to the north and bear right when the trail forks. When you come to a stairway that goes up, step over the railing and continue north (downstream). This is not advisable if there is snow, ice, mud, or darkness. The trail is not maintained, but it is used in season by fishermen. There is a narrow section with a steep drop-off. The lower section requires a bit of scrambling over boulders. To get close to the falls requires more scrambling and is not advisable when the river is running high. There is convenient parking in Maplewood Park directly across Driving Park Avenue from Lower Falls Park.